In the Distressed Credit segment, RoE & RoA have gone from 21.3% & 4.2% in Q2 to 37.2% & 8.4% in Q3. All thanks to Brajsaab? 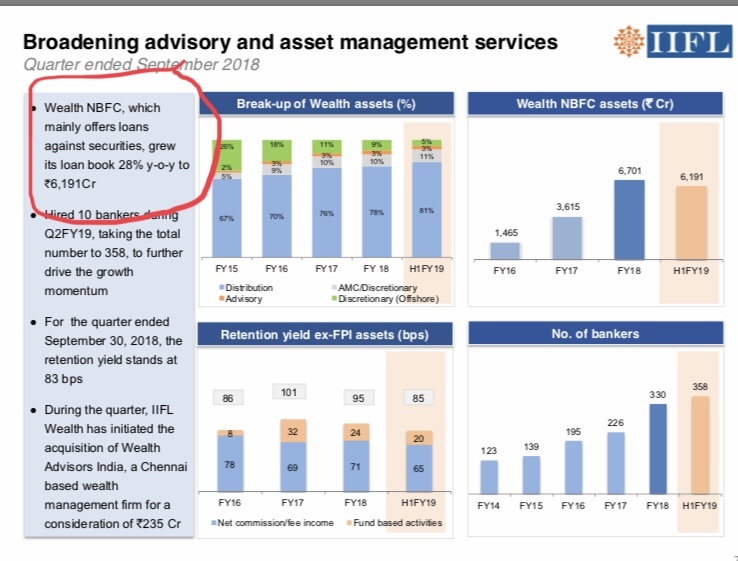 This is going to be key differentiation for Edel as an NBFC. They have indicated that 20-25% RoE is sustainable in ARC business but it is going to be very lumpy. This quarter’s ARC nos are mainly due to one-off recoveries like Binani. Essar resolution is nearby and perhaps the last one in steel but the next wave of earnings will come from Power assets that too dependent on polices of the new govt. I think pricing of impaired asset will get impacted due to outsized returns they are making offlate and consequent rising competition. Yes, that’s true if you look at short term movements, however, with the nature of ARC type businesses, it’s always a pretty long term play. Along with other businesses, which plays a diversification role for Edelweiss, I guess this is a pretty good stock for a medium to long term horizon. The selling, it said, precipitated a fall of Rs 13,000 crore or 55 per cent in the market capitalisation of Reliance group. L&T Finance sold 49 lakh shares of Reliance Infrastructure at Rs 120.98 per share. 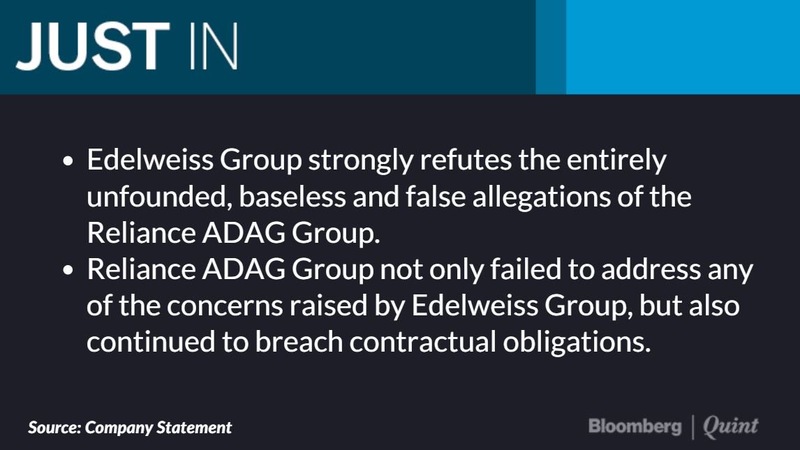 If Edelweiss is a professional company, why did they invest in ADAG ? Don’t they know ethics level of Anil Ambani group companies ? More so, why hold these shares so long ? The press release talks about granting “credit facilities against pledge of shares” - LAS is one line of their credit business. I don’t think they “invested” in the ADAG group. 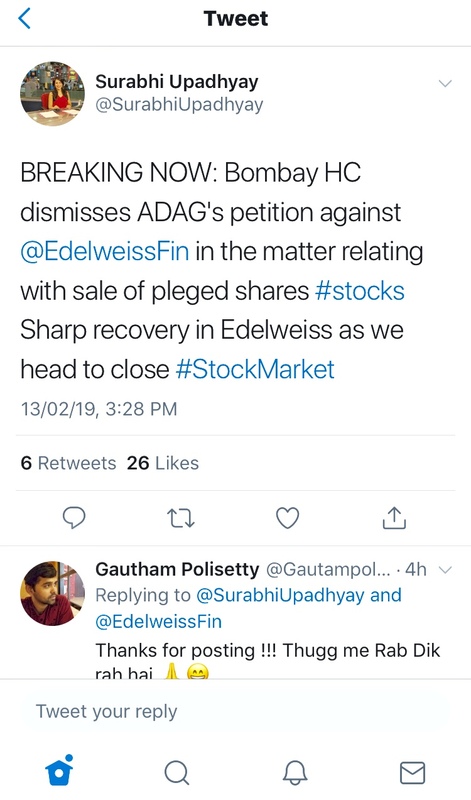 As per news reports Reliance ADAG has asked SEBI to ban Edelweiss from ‘all capital market activities’. Reliance ADAG group is losing credibility day by day and the fact that such a complain would come to nothing was almost certain when the news broke out. However the amount of panic selling shows the low institutional buyer support for the stock… There were not many buyers even when the stock fell more than 10% intraday… Price rebound was only after this positive news. PAT of about ex insurance about Rs 273 Cr and consolidated PAT of Rs 226 Cr. Consolidated PAT is Rs 763 Cr and ex insurance PAT is Rs 906 Cr which shows a growth of 22% and 27%. Balance sheet grew by 14 % to 55,822 Cr which is almost same compare to last quarter. ROA stood at 2.4 % ex insurance. ROE stood at 15.6 % ex insurance. The fall has come down because of the gearing ratio come down to 4.2 from 5.2 last year same quarter. In terms of liquidity company had almost 365 days of liquidity . Company has slowdown the wholesale book , took all the repayment that clients were due and a lot of the repayments were paid on the due date. Raise 9,000 Cr of fresh borrowing and two-thirds of this was more than one year non-commercial paper led and that is actually one of the highest. In every quarter for long term company had raised between 3,000-7,000 Cr in a quarter. Now company have balance sheet liquidity of 14,000 Cr half of it is overnight money and treasury bills of about 7,000 Cr and have another 7,000 Cr in liquidity which come to company in 30-45 days. 25% of the balance sheet can be converted into cash between 30 to 45 days. Commercial papers have come down to 7 % , it has come down from 29 % to 18 % of total borrowing from last four years. Long term debt is 62% compare to 59 % last quarter. Focus will be on ALM management , liquidity management will continue to be there it does increase cost of funding. Company have a capital adequacy of 17.8 % for this quarter. Mutual fund will account for about close to 20% of borrowing , 40 % banks , 19 % Retail and 10-12 % insurance companies. 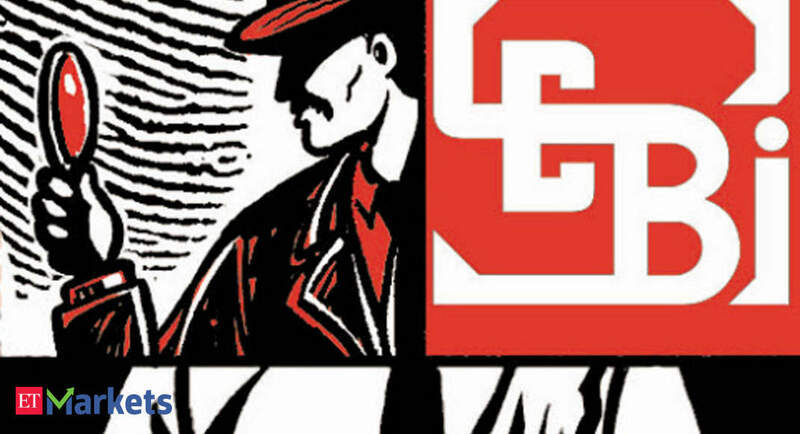 Company book came down by almost about Rs 5,500 Cr out of which the LAS book which includes ESOP financing as well as the loan again shares came down by about Rs 2,000 Cr. Large part of this was due to the equity market volatility and turbulence . Distressed ARC book will continue to grow by 20 % and company see a lot of opportunities in NPL loans sold by banks. The corporate book will remain flattish depending on the market environment and opportunities. Company stage-3 on balance sheet went down from Rs 743 Cr to Rs 654 Cr and provisions also declined from Rs 133 to Rs 107 Cr for this quarter. GNPA remain at 1.84 % and NNPA at 0.78 %. Closed a $ 1.3 billion stress asset fund which is one of the largest funds raised in India. Company had crossed 1 lakh Cr of AUA and that continues to grow and in both asset management and wealth management. In asset management company also won CPSE ETF mandate given by Government of India and this is a fairly strong franchise opportunity for company. In SME now company operate 100 branches compare to 40 branches last year. PAT in wealth management will maintain 20-25 % growth from FY20. Cost to income ratio is expected to remain in 50-55 % peak range for next three years as the book start scaling up. Cost of borrowing will come down by 40-45 basis points if RBI cuts rates and liquidity improves and company should be able to pass on part of that to the customers. 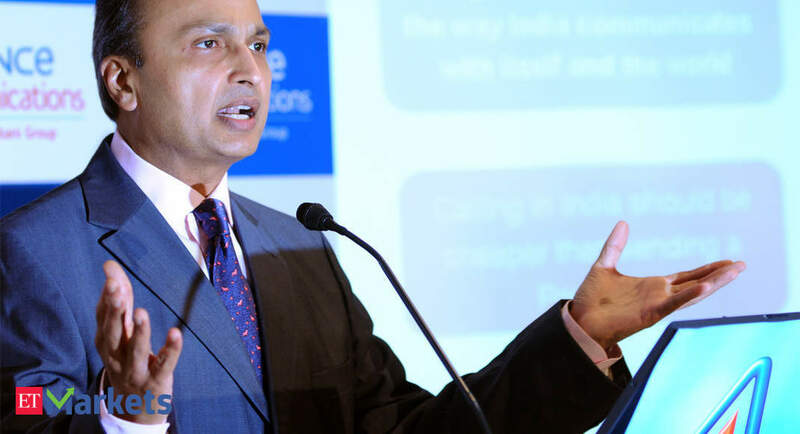 Reliance ADAG takes on Edelweiss Group on issue of sale of pledged shares. Wow! Thanks for uploading such useful materials. The management seems quite forthcoming! This is fantastic work, thanks a lot. Clients can withdraw or transfer their securities or funds within 45 days, without any additional cost. Professor’s tweet earlier today. 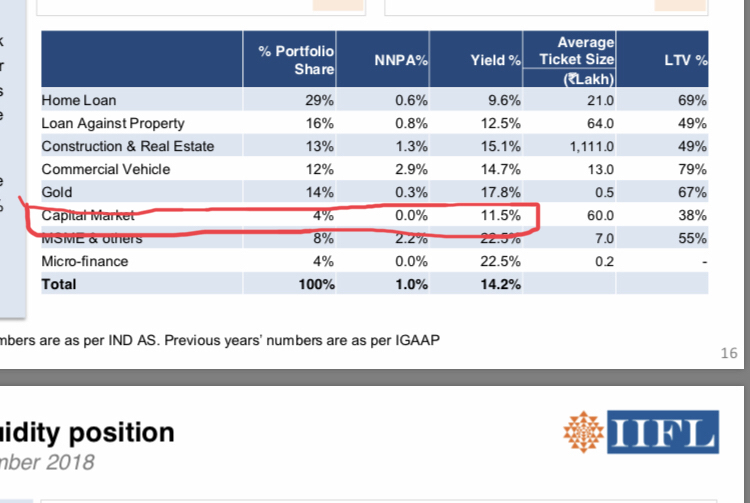 I have not read about 10% average IR loans for LAS given by Edelweiss in last 3 concall transcripts. Hope I have not missed it. Is he talking about IIFL or JM Financial? Anyone knows which NBFC he is talking about. Developer Financing as a % of Net worth is actually far higher for Edelweiss. My guess is that it is IIFL. From concall commentary in LAS Edelweiss primarily lends to high level executives who borrow against their ESOPs. To my mind that is not such a risky proposition as compared to promoter financing where volumes for a single share can be large and illiquid. Also the value of IIFLs LAS portfolio is far higher than Edelweiss’s. 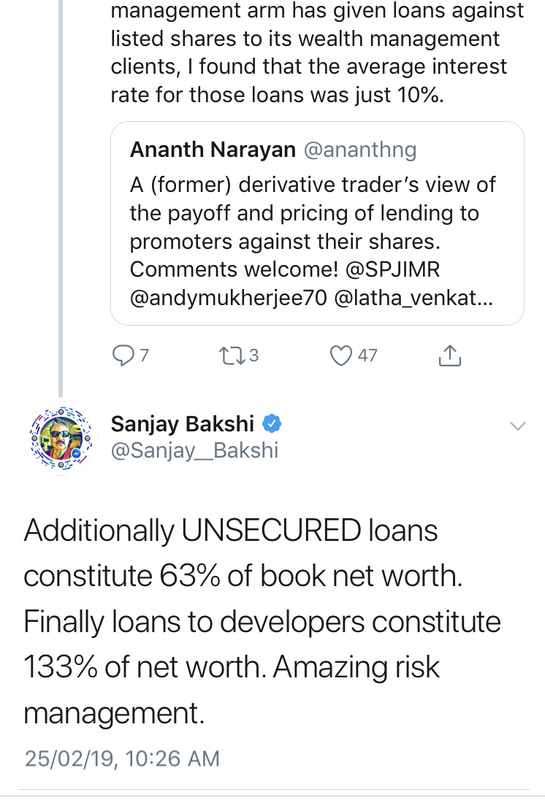 Further, since Edelweiss’s cost of borrowing itself is above 10%, it wouldn’t make much sense to keep Average rate of lending at 10% for LAS. Good companies will always attract best partners and can always get liquidity at their own terms. CDPQ Private Equity Asia Pte. Ltd., a wholly owned subsidiary of Caisse de depot et placement du Quebec (“CDPQ”), one of North America’s largest pension fund managers, has signed an agreement to invest over INR 1800 crores (approximately US$250 million) in ECL Finance Limited (“ECL Finance”), the non-banking financial company (NBFC) arm of Edelweiss Group. The planned investment by CDPQ would contribute towards establishing a large and diversified credit platform in India. Not clear if this is equity or debt or both. Good development overall.